A consortium led by Repsol has found new gas resources in Indonesia estimated at at least 2 trillion cubic feet, the Spanish oil and gas firm said on Tuesday, equivalent to around two years' worth of Spanish demand. 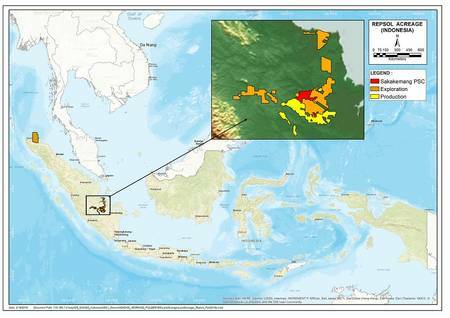 The discovery at the Sakakemang block in South Sumatra is among the 10 largest finds worldwide in the last 12 months, and the biggest in Indonesia for 18 years, Repsol said. Following its strategy to maximize the use of gas as major economies phase out carbon, Repsol plans to drill another appraisal well in the area in the coming months, it said. The Madrid-based firm operates the well and holds a 45 percent stake, while Malaysia's Petronas owns 45 percent and Japan's MOECO the remaining 10 percent. The find would translate into more than 350 million barrels of oil equivalent. Before this find, Repsol had global gas reserves equivalent to around 1.7 billion barrels of oil.